I’ve made it through two days back at work, but like many years before, my mind is still back on the week of biking and camping with friends. Those days are a powerful elixir that takes a while to wear off. 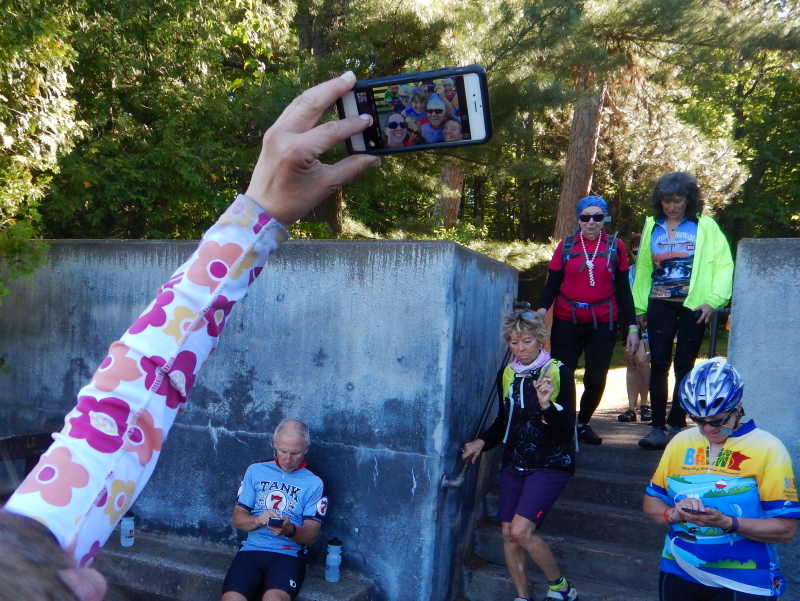 The Tour of Minnesota is holding a photo contest which provides me an opportunity to revisit the trip, with an expanded view from my own, by perusing the 200-plus submissions from fellow riders. I hope this isn’t an omen. 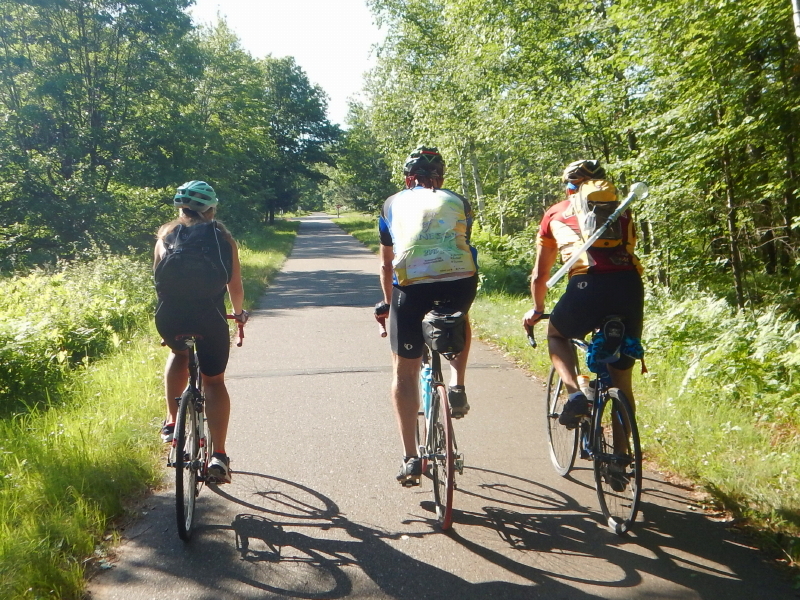 This coming Friday and Saturday we have scheduled a custom event at Wintervale for close friends that is intended to serve as a warmup to the annual Tour of Minnesota bike and camping week in the middle of June. I didn’t mean it to become a conditioning exercise for nasty weather. I don’t want the weather we are currently burdened with to be representative of what we can expect in a month’s time. The good news is that the last few days have provided several quiet moments of time when it is not raining, between the cataclysmic outbursts of over an inch-per-hour gully-washers festooned with spectacular flashes of lightning and heavy rumbling thunder that roll overhead in gargantuan waves. A temperature of 56° with 100% chance of precipitation is not the kind of weather in which I want to ride. Our rain gauges are getting a good workout, needing to be frequently dumped of the inches accumulating by the hour. It’s crazy making. Meanwhile, animals just seem to deal with it. Our horses usually choose to stand out in the rain, but occasionally they will stay under the overhang. 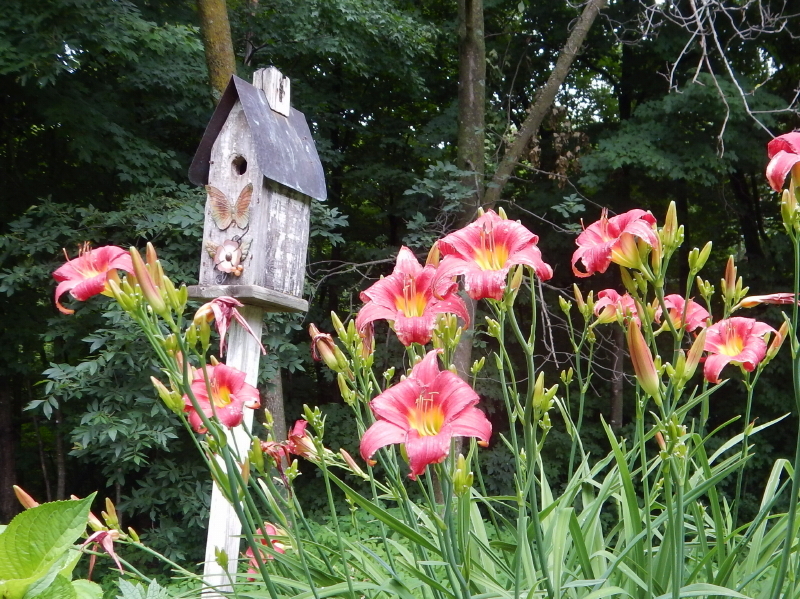 I wonder if it might be that they are growing used to the roar from the metal roof. The wild animals are usually hunkered down far from sight, but yesterday Cyndie came across this beautiful fawn curled up on the edge of our north trail. She reported that Delilah had completely missed sensing the little one and walked right past, oblivious. The momma must have done an excellent job of cleaning the newborn to minimize any scent. 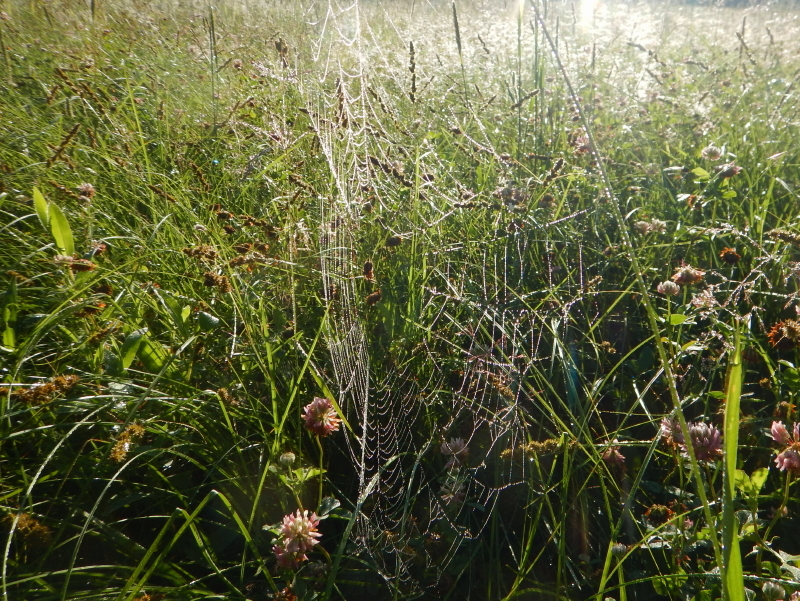 There was no sign of the mother, but she was probably nearby, observing. When I got home from work, Cyndie took me out to see if the fawn was still there. She held back with Delilah as I moved ahead and scanned the trail. I kept asking her if we had reached the spot yet, because I wasn’t seeing anything. We figured it had probably moved on. Just as I was about to head back, my eye caught a glimpse of the brown color. It had definitely moved, but not very far at all. 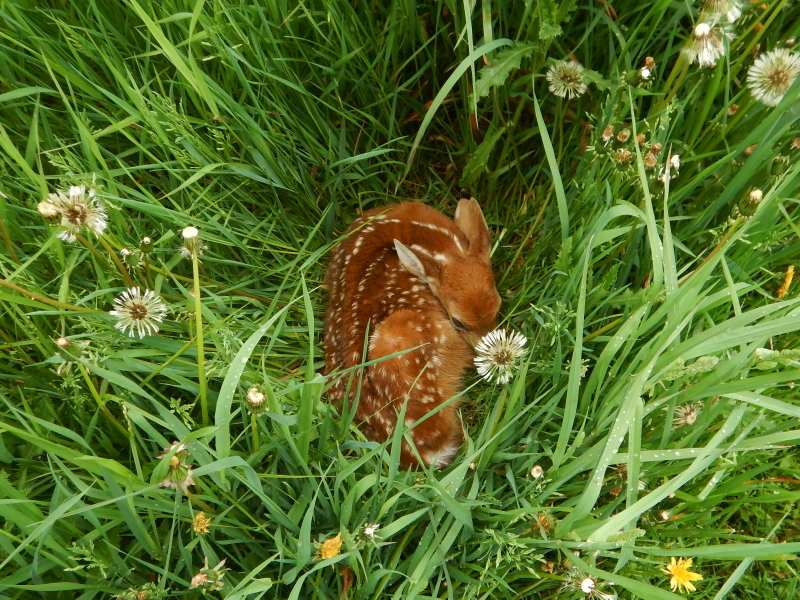 The fawn had settled in a new spot, a little off the trail, so that it was better surrounded by the tall grass. I reached out to snap a shot looking down from overhead and then we stepped away. We didn’t have much time to tend to the horses before the next deluge. 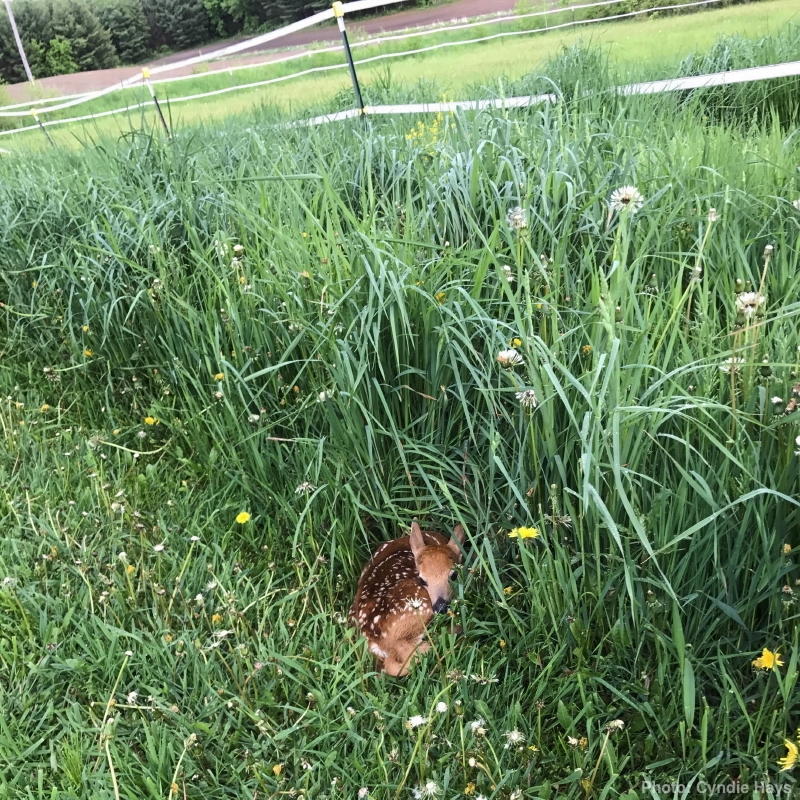 As the rain pounded down with dramatic intensity, I wondered about that fawn folded up in a tight little ball among the tall grass. I was hoping the momma had showed up and guided a route to the woods for better cover. Or at the very least, higher ground. For the most part, my week of biking and camping was perfect. Weather was good, trails and roads were great, and my body delivered everything I asked of it. I was in the company of really great companions who fed my soul and entertained my brain. However, my performance wasn’t entirely without incident. There are many driveways and a few roads that the trail crosses, and at each one there is a stop sign. We are supposed to stop at each one, but in the rural setting there is very little traffic present. Instead of stopping, we would most often yield, pausing to look for cars. After miles of no traffic, we arrived at one where a large truck had just crossed our trail and was waiting to turn onto the adjacent highway. We were talking and Rich had pulled out his water bottle as we approached. Suddenly I spotted a pickup truck pulling up behind the larger truck. In a split second decision, I raised my hand in a wave and rolled through between the two vehicles, but Rich and Steve abruptly hit their brakes. I figured the pickup couldn’t go anywhere with the larger truck stopped in front of it. 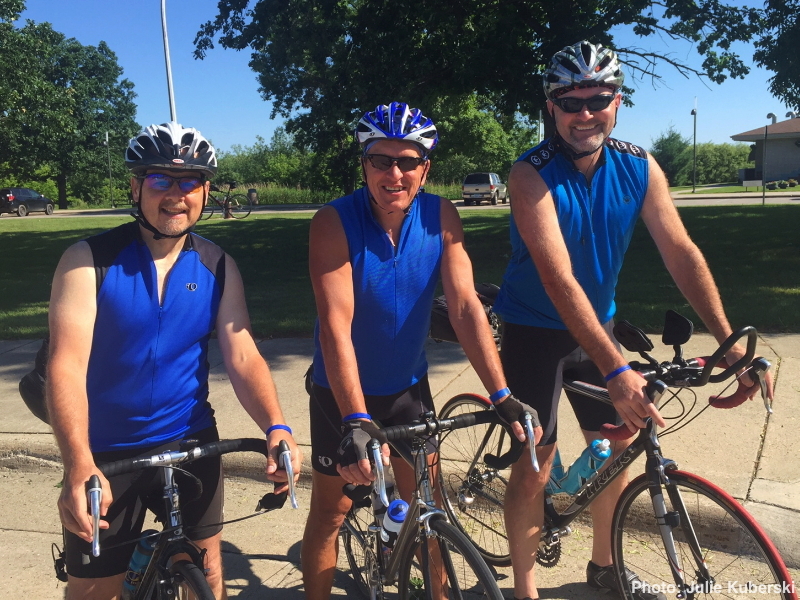 The other two made the proper decision, but paid a price when their rapid deceleration led to their bikes tangling and a spoke on Rich’s front wheel getting bent. Our behavior seemed to rile the driver of the pickup truck, as he then raced around the large truck and cut across it in a right turn, racing his engine as he sped off. Thinking that the spoke was broken, we gingerly made our way to the day’s destination, worried about a risk the wheel might collapse. Luckily, it wasn’t a broken spoke after all. Mike, our trusty Penn Cycle mechanic supporting the trip, was able to straighten it out and true the wheel, good as new. 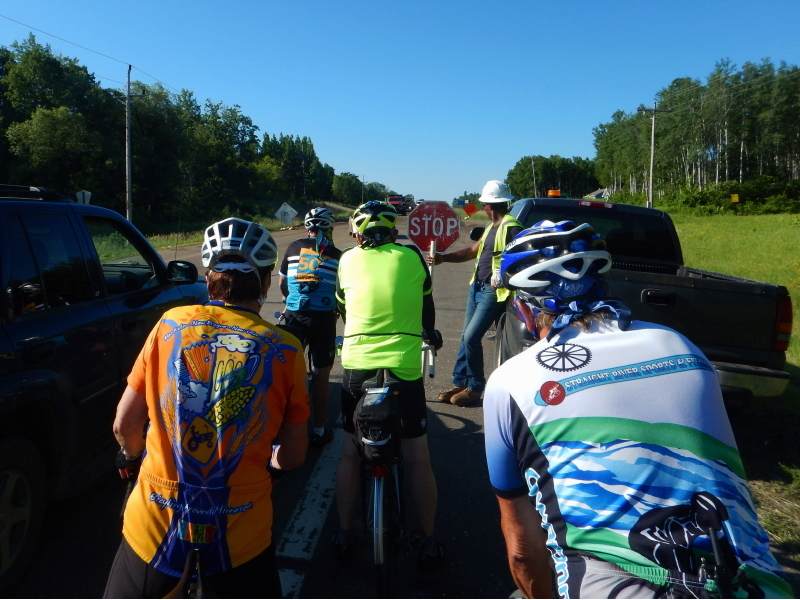 The second close call happened at the end of the week as we pulled back into the town of Brainerd. I was in a small group of riders who were all seeking the best route to the fair grounds. We crossed a street at an intersection with cars waiting their turn. Folks announced their intentions with calls of “Slowing!” and “Stopping!” I twisted my right foot out of the clipless pedal in preparation of stopping, and then got caught with my weight on the other foot. I followed their calls with one of my own. I came out of it with nothing more than a bruised hip, forearm and ego. My favorite photos from cycling are usually ones taken on the road from the bike. When I remember, I carry my pocket camera in my jersey so I can slip my hand through the strap and pull it out for shots on the fly. Unlike my sure-handed friend, Rich, who deftly wields his iPhone for photos from his bike, I want the comfort of knowing the wrist strap will back me up when I fumble the grip. Even when I remember to have the camera at the ready, usage requires I have ample space to allow my bike to wander off course a bit in the act of capturing shots. I have a tendency to float across lanes when I twist my torso around to compose a view behind me. Good shots can be had when a lot of bikers are bunched up, but those are not times I feel safe to be veering off course in the act of shooting. 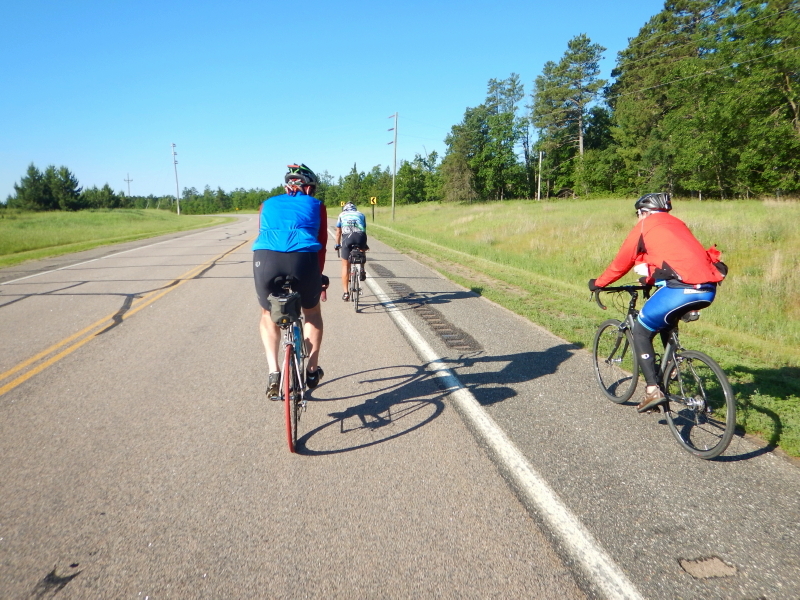 Although the majority of this year’s Tour of Minnesota was on bike trails, there were still a few occasions when we were out on the open road. With only minimal traffic and an ongoing intermittent rumble strip to deal with, we had opportunity to spread out and stretch our legs. It was good to have a little variation from the monotonous, albeit beautiful, miles of railroad-grade paved trails. At one point we came upon a crew repaving the road. We simply joined the autos in waiting a turn to pass through the construction zone. It felt a little too exposed to be on a bicycle, just a few feet away from fresh steaming hot asphalt, large dump trucks, and huge steam rollers crawling along as we rode through. Some riders cannot resist the urge to stop and shop whenever we come upon garage sales. It pays to have a way to carry new treasures when shopping by bike. Doobie is one to find a way when his muse hits. Light saber on the backpack, stuffed python snake wrapped around the bike frame. He doesn’t let anything bog down his free wheelin’. I’ve been home one day and I am noticing a distinct void from the abrupt absence of the large group of companions I enjoyed last week. Though personal space and familiar comforts of home are precious, the camaraderie we shared can be addicting, putting up a good fight for my desire. Now I’ve got my bathroom and bed back, but a lingering longing for the instantly available connection with inspiring souls leaves me wanting. I think that is what draws so many of us back to this annual ride each succeeding year. 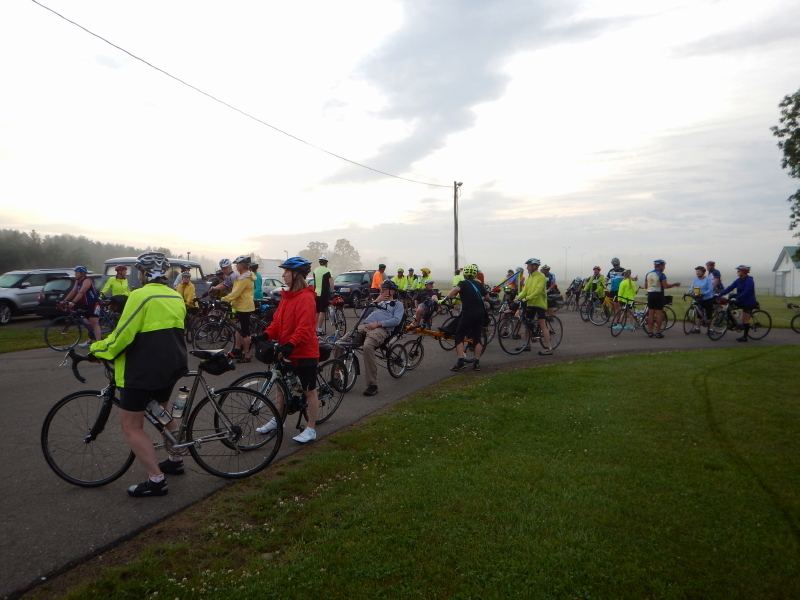 Looking at a picture of the very first morning, taken just moments before we pedaled off en mass on the first leg of the week, I am instantly reminded of the excitement and anticipation of what lie ahead for us. It started out with a damp fog just above the ground, but our 2016 ride in the heart of the state was blessed with some great weather and easy riding. A high percentage of our miles were accomplished on the 115-mile-long Paul Bunyan State Trail between Brainerd and Bemidji. I had a really nice time meeting riders that were new to our group this year, discovering kindred spirits from as far away as Maryland, Texas, and Colorado, as well as a few from within the state of Minnesota. They all won a piece of my heart, but challenging that for the highlight of the year for me was the opportunity to ride with first-timer, Sarah Gordon, the 10-year-old daughter of my treasured friend, Rich. They rode together on a borrowed tandem in a brave “test of concept” exercise for both. I could see how difficult it was for each of them to manage at times, and they did a spectacular job of facing the challenges and achieving their goals, all while maintaining a superb attitude. They inspired and energized me greatly. Sometimes we can become narrowly focused on doing this ride for our own personal reasons, but there is an equally significant value for those around us when we make the decision to participate. I am forever grateful that Sarah decided to ride with us this year, and equally thankful for the rest of the crew, new and old, who showed up this year to make the 2016 Tour of Minnesota a particularly special biking and camping week. How ’bout we do it again next year, eh? When you don’t work on Fridays, Thursday night becomes the early occasion to party like the weekend is upon you. 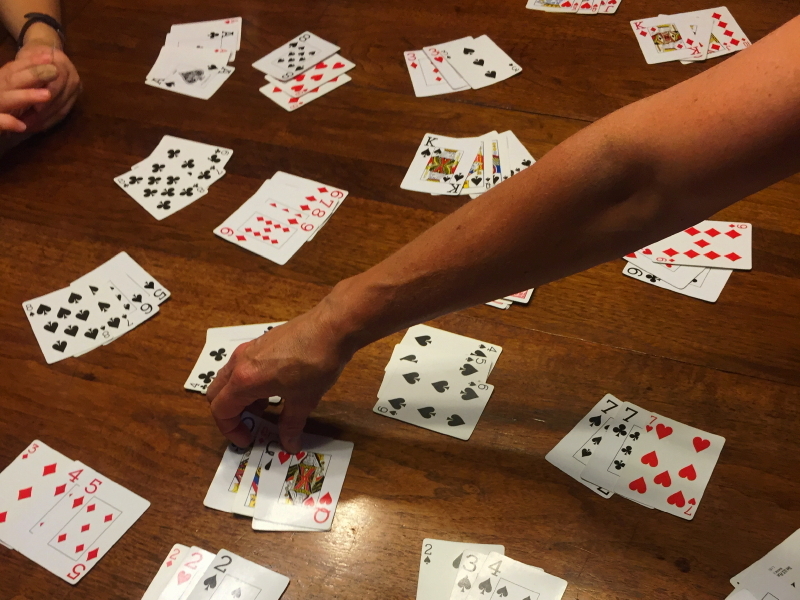 Have some neighbors over, eat a feast, play some cards, and stay up late having loads of fun. Bring on my 3-day weekend. It’s my last one before leaving on the annual week-long June bike camping trip, The Tour of Minnesota. I guess I better start thinking about preparations. Will it be a hot trip this year? Rainy? What should I pack? I’m thinking about trying a minimalist approach this time around, so the questions take on more significance for me. In one week, I will be making a final decision about what makes the cut. I hope the weather forecasts show some general agreement by then, and as long as I’m hoping, that they predict nothing but the smallest of chances for rain.